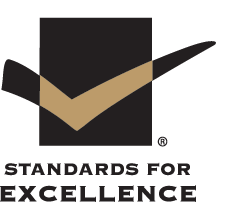 Accreditations & Certifications | Service Coordination, Inc.
Service Coordination, Inc. (SCI) is a recipient of the Standards for Excellence Institute’s Seal of Excellence for successfully completing their rigorous accreditation program. SCI voluntarily opened itself up to analysis by a “jury of its peers.” The peer review team examined SCI for compliance with the Standards for Excellence®: An Ethics and Accountability Code for the Nonprofit Sector, in areas including: Mission, Strategy and Evaluation; Leadership: Board, Staff, and Volunteers; Legal Compliance and Ethics; Finance and Operations; Resource Development; and Public Awareness, Engagement, and Advocacy. The Standards for Excellence Institute evaluates fundamental values such as honesty, integrity, fairness, respect, trust, responsibility, and accountability, all of which are inherently important in the nonprofit world. SCI’s programs and services, management, fundraising and financial practices were subjected to in-depth examination prior to earning accreditation. “This award is a reflection of the staff’s high level of efficiency and integrity as well as a symbol to the community of the organization’s commitment to providing the highest level of quality supports to those we serve.” says Carl Hildebrand, President of SCI’s Board of Directors. The Standards for Excellence Institute is committed to raising the level of principled and responsible practices within the nonprofit sector. The Institute offers a model for organizations to implement in their operating plans so they can gain a deeper understanding of their effectiveness, improve their decision-making and minimize risks. Nonprofits that adhere to the principles and practices of strong nonprofit management and governance can become formally accredited under the Standards for Excellence® program. Service Coordination, Inc. (SCI) was honored as a 2018 Baltimore Corporate Culture Award Winner by CEO Report on February 7, 2018. The Corporate Culture Award honors companies that encourage a creative and collaborative culture and leaders who understand that culture is a critical asset to a company’s performance and growth. At SCI, we work together, as a team, to navigate, guide, and build on the unique strengths and talents of each team member to offer the highest quality services. We offer our team members transparency, flexibility, the right tools, and plenty of opportunity to grow. “Investing back into our team members puts SCI at the forefront in building a great company culture” says John Dumas, CEO.